Hi hi and happy nearly-almost Fall! 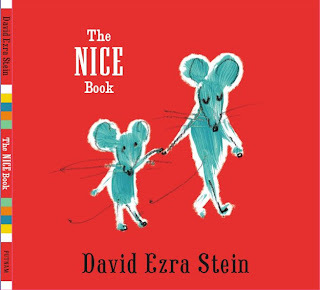 My new one, The Nice Book, releases October 16. Hope you will check out the PARTY at Books of Wonder on the 15th! We'll write a nice story together, and a mean story; You can nominate someone you think is nice to win a free book; and we'll find out, HOW NICE ARE YOU? This is going to be, well, for lack of a better adjective, nice!
. . . A variety of animals from bugs to elephants practice what it takes to be nice. . . . There’s plenty of humor here. . . . The images were created with a mix of acrylic paints, ink and china marker, combined digitally—the effect is beautifully childlike. . . . Nice indeed. Ho ho! It will be from 5-7 pm! Hope to see ya there!